I read this quote today and was totally fascinated by it. I have so many women come into the shop thinking they’ve made their bed and so they must lie in it, so to speak. Since I’ve started my Sensuality Coaching practice, I’ve been overwhelmed by the levels of complacency that sets in for women as they enter their late 30s and 40s. In their marriage. In their self image. In their way of life. In their hopelessness of living a sensual life. I’m always finding tools and exercises that wake women up to their fullest potential. And in today’s research I found this quote and it literally slapped me upside the head. It’s the quote of perfection to the story I’m trying to tell. 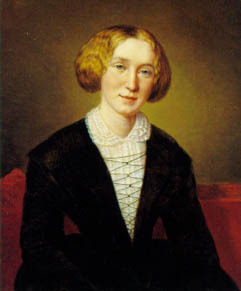 And who more interesting to write it than George Eliot? Or should I say Mary Ann Evans. I’m not saying her life was perfect. Far from it. But in a very buttoned up Victorian society, she found a way to live her life as a woman in a man’s world. Living the male sensibility in business and love. And what a fantastic challenge to herself and all that she came across. And what a fantastic lesson for us. Yes, we can challenge her choices. We can challenge her happiness. We can even challenge her stability in some cases. But what we can’t challenge is her incredible strength and pursuit of living her life her way. To her expectation. On her own path. To live her life in the now. This brief encounter with George this morning was such a thoughtful and important reminder to women who feel their life is dictated by the path they’ve chosen. It’s never too late, ladies. Life is not linear. It’s on a divine path in divine time. And the divine is far from linear. This quote reminded me to move forward with my dreams though I’m not sure what it looks like on the other end. But waiting to figure it out leaves me far behind the pack. Living it to the possibility today means I continue to move forward as a leader in a category that barely exists. I’m breaking conventions with my shop. I’m certainly challenging the norm with my message. And I’m making it up as I go along. And I’m okay with that. But on the days that I feel like a failure, the days I don’t know what forward looks like, I am reminded that I ALWAYS have the opportunity to be the person I see in my future. I have to live towards the life that is my vision each and every day. And not reminisce on its possibility.